Not only does KELLY HOPPEN reign supreme on television in the U.K., but she has a trademark style that translated into home accessories, furniture, carpet, paint and linens. KELLY enjoys sharing her vast knowledge and regularly offers classes through her design school and her design books are written to make you feel that KELLY really wants you to learn and not just look at the pretty pictures. KELLY has been designing for 30 years and has created a signature style that includes a mix of monochromatic colors, organic materials and East meets West. In 2009, Metropolitan Home featured KELLY’S London loft and since it’s the epitome of her signature style I wanted to share it with you. 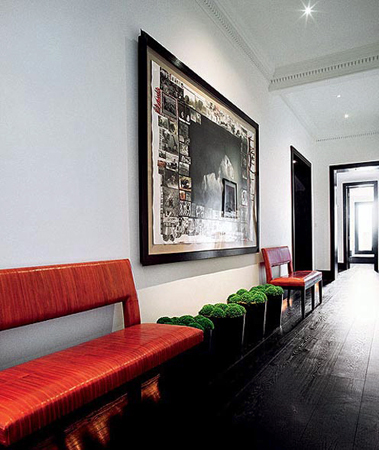 CHRISTIAN LIAIGRE benches and multiple moss pots in the entrance foyer. 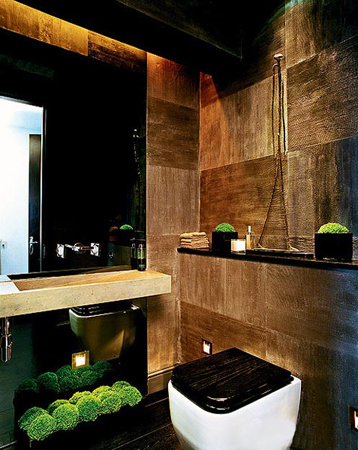 I love this dark and brooding powder room especially the walls. 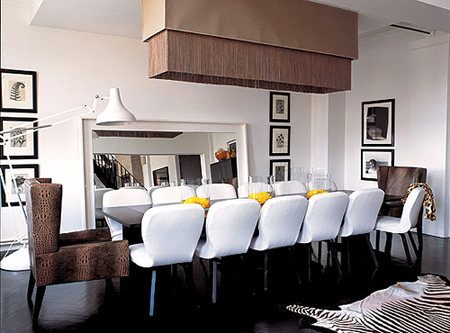 The fringed pendant in the dining room is by MAT and JEWSKI’S. In the kitchen, a bubble chair and a black and white photograph of Muhammad Ali by Flip Schulke. 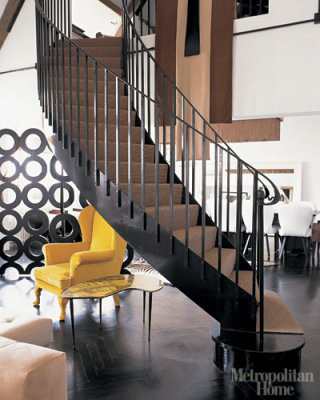 In the living room, a winding stair case and a bright yellow chair for that signature HOPPEN color pop. 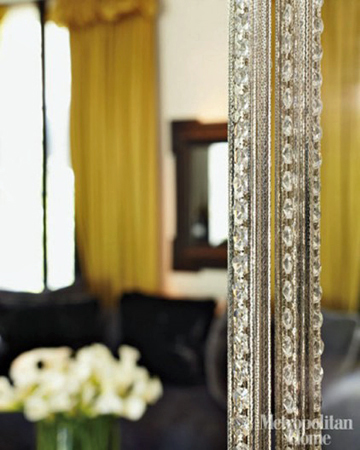 Peeking through KELLY’S signature ring screen is a photograph of Marilyn Monroe. In the breakfast space, KELLY’S custom chain mail blinds.